I am sitting watching another spectacular sunrise. Looking out over Canandaigua Lake through the last of the dark, the feeling is always the same. A certain kind of peace. Being home, not just with my family, but with that place in me that finds joy in anticipating something new and unexpected within the quiet knowing that the sun always rises. I reach for my camera and attempt to capture it…. And then again the following morning…. And then finally, Thanksgiving morning, I realize I would have to leave the room to go fetch my camera and I would miss precious moments of the spectacle of exploding color and fire in the sky. So I stay. Even feeling the discomfort of staying because the urge to ‘bottle’ this moment is so strong. Sigh. 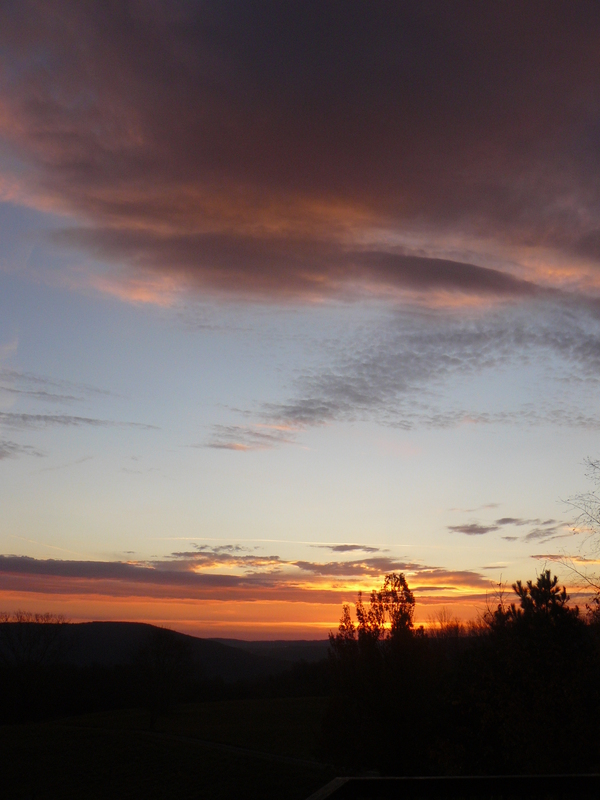 As I reflect on this now, I think about the other side of the day, when darkness comes early and the feeling of sunset and the ‘end of the day’ gets captured in the warmth of what I prepare for supper. It is a solo affair these days. 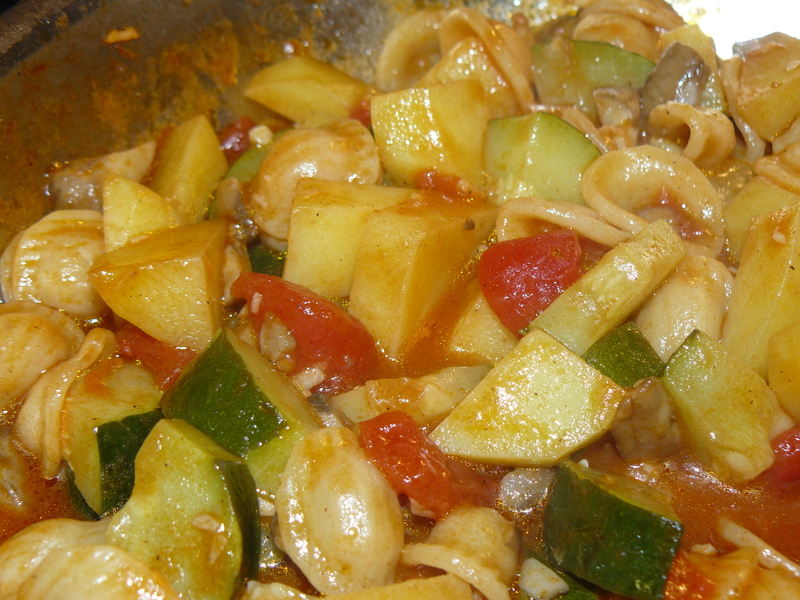 And even so, I notice with interest where I ‘go’ to create this warmth, always finding joy in the ritual of combining olive oil and garlic and tomatoes with fresh vegetables and some sort of pasta or grain. Not unlike each sunrise, this ‘sunset’ for me captures the uniqueness of the moment within a knowing that the contents of the pan will always satisfy! Smile. The familiar process of chopping a large clove of fresh garlic and adding it to several tablespoons of olive oil never fails to start this engine! One night I add to this a handful of chopped mushrooms, cook until the liquid releases from the mushrooms, then add a chopped potato and a cupful of fresh cut green beans, a little water and cover the pan to steam a few minutes. 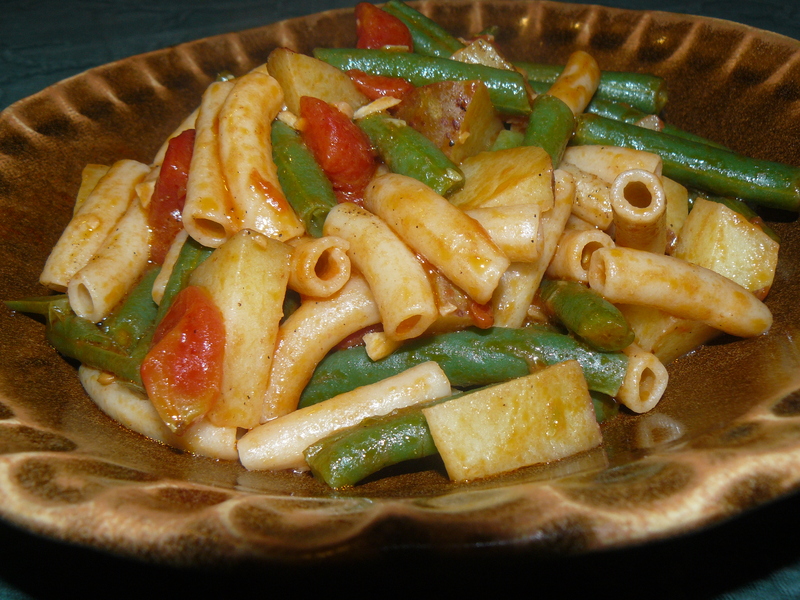 Prepare a small amount of brown rice penne al dente. There is about 1/2 cup canned diced tomatoes in the fridge which I add to the pan of vegetables with more water and tomato paste to make a thickening sauce. Add the pasta and salt & pepper and mix thoroughly in a gentle simmer until the feeling of the pasta merging with the sauce is complete. Cover and let sit while cconsidering which plate it will fill…. 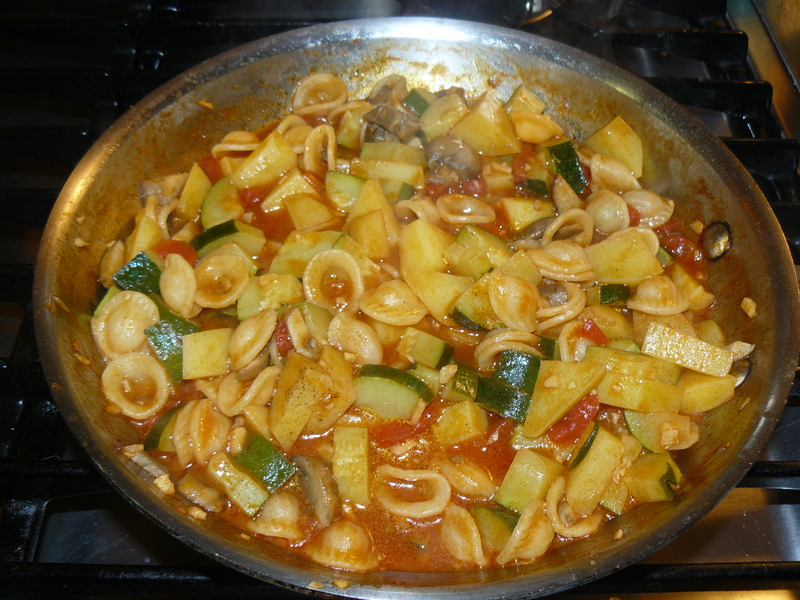 Another night it is a whole medium chopped zucchini, small chopped potato and orecchiette pasta, in the same mushroom, garlic, tomato sauce, made the same way….another big yum! There is something about sensuousness of this pot tonight that compels me to get even closer, and I realize how like a sunset this is, the dark now compelling me to go within to find my light and my pleasure vs. the sunrise which compels me to go ‘out’ into the light of day…. Another night it is chopped kale and potato and about 1/4 cup leftover cannelli beans with more of the orecchiette pasta, in the same mushroom, garlic, tomato sauce, made the same way….another big yum! It is a week of such ‘sunsets’, and I finally stop photographing them, feeling the same discomfort in letting it just be what it is without capturing it in some way, AND the same peace in knowing I can still find and enjoy this place right now. 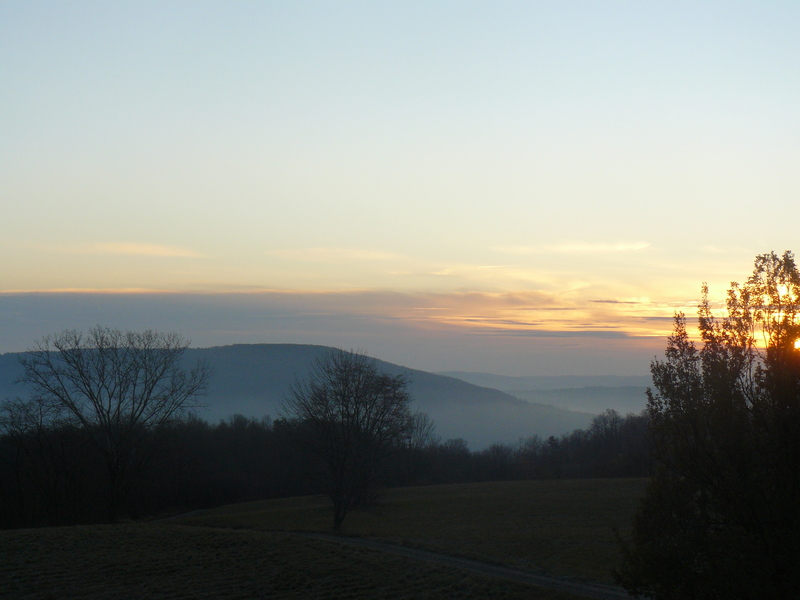 The last morning of our family Thanksgiving visit is yet another spectacular sunrise, signaling yet another day of cherished time spent together. The camera is sitting right next to me…..smile…. Beautiful sunrises. I appreciate you capturing them for us. 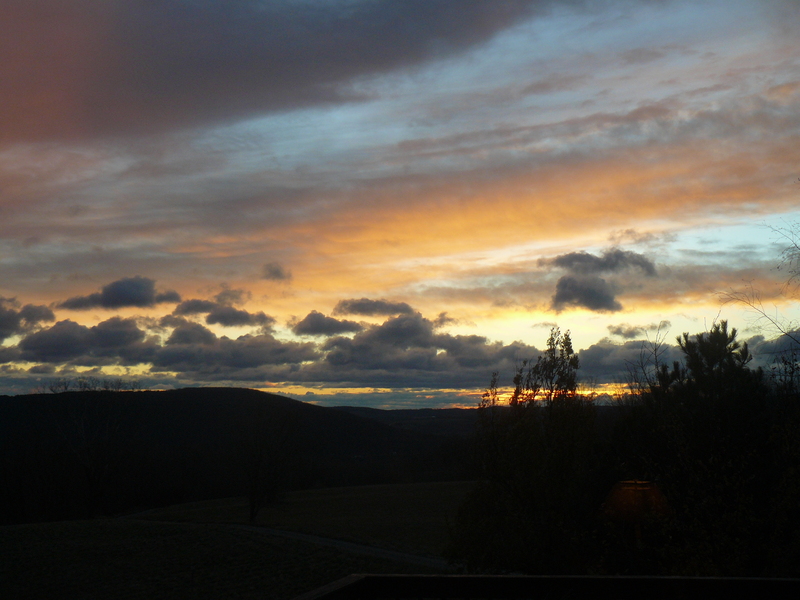 And yummy sunsets! Gorgeous! The beauty and serenity of nature… and her bounty…. nourishes us on every level.